As part of an international collaboration called GW-LCYCLE, scientists from MISU are currently performing light detection and ranging (lidar) measurements at Esrange, northern Sweden. The lidar observations complement experiments that are conducted aboard the German research aircraft FALCON. The comprehensive measurement campaign focuses on the excitation and propagation of gravity waves in the atmosphere. Northern Sweden provides excellent opportunities for such studies as the Scandinavian mountains are a prominent source of mountain waves, a particular class of gravity waves. The GW-LCYCLE campaign is conducted on December 1-13 with the German research airplane FALCON based at Kiruna airport. The research aircraft is equipped with meteorological sensors, instruments for the detection of trace gases (like carbon oxide, ozone and sulphor dioxide), and a Doppler wind lidar for the observation of vertical winds. The measurements target the tropopause region, which marks the barrier between the troposphere (the lowest 10 km of our atmosphere) and the stratosphere (the height region 10-50 km that contains the ozone layer). This year's campaign is a precursor of a very comprehesnive campaign that is planned with two aircrafts and extensive ground-based measyurements during the winter 2015/2016. MISU’s Atmospheric Physics group supports these campaigns with lidar measurements performed at Esrange Space Center (68° N, 21° E) near the Swedish city of Kiruna. Measurements with the Esrange lidar cover the atmosphere from about 4 to 90 km altitude and provide detailed information on temperature as well as on the properties of clouds and aerosols. This information allows us to study the excitation and temporal development of atmospheric gravity waves over Esrange. Gravity waves allow for a transport of energy from the surface to higher atmospheric layers, and thus, influence the circulation in these altitude regions. The MISU group also participates in coordinated launch activities of weather balloons (radiosondes) at Andoya (Norway), Kiruna airport (Sweden), Esrange (Sweden), and Sodankylä (Finland). Temperature measurements from radiosondes launched every three hours over a period of up to two days provide complementary data on the occurrence and distribution of gravity waves over northern Scandinavia. 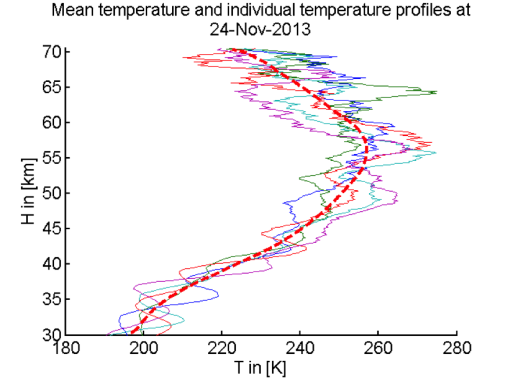 The figure shows an example of temperature perturbation induced by gravity wave activity measured on the 24th of November.